Sipapu Natural Bridge in Natural Bridges National Monument, Utah. Photo by Jay Wilbur, NABS. Natural Bridges National Monument contains three very large meander natural bridges, one of which, Sipapu Natural Bridge, is included in this list of giant arches. The span of Sipapu Natural Bridge was originally reported at 268 feet by Douglas in 1908, who also reported a height of 167 feet. However, a measurement by Jay Wilbur and Craig Shelley in 2007 using modern methods (precision laser ranging and a mathematically precise definition of "span") yielded a span of 225 ± 3 feet and a height of 144 ± 5 feet. You can drive to a viewpoint overlooking this arch, but a much greater appreciation can be had by hiking the short trail that goes below it. The round trip hike is 1.2 miles with 600 feet of elevation gain on the way back. The views from below and from half way down are spectacular. Natural Bridges National Monument is located a few miles off Utah Highway 95, 42 miles west of Blanding. 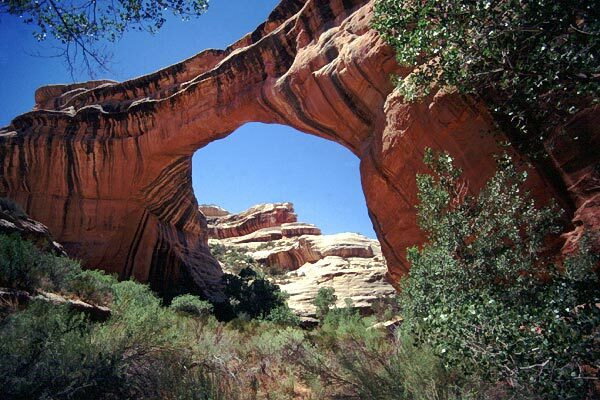 The other two large natural bridges in the monument are Kachina Natural Bridge and Owachomo Natural Bridge. Each can be reached by spur trails. Owachomo is probably the most photogenic of the three, and the trail to it is also the shortest. It can be seen from a parking overlook and can be reached on a trail of 0.5 miles round trip and 180 feet of elevation gain on the way back. A photo of Owachomo Natural Bridge graces the cover of Fran Barnes' Canyon Country Arches & Bridges (see References). Another way to reach these three bridges is by a loop trail along the canyon bottom that connects all three. This hike is 8.5 miles round trip, but can be shortened to 6 miles if you can set up a car shuttle. The canyon between Sipapu and Kachina is especially lovely and contains some Anasazi ruins. The Natural Arch and Bridge Society was a partner in creating an exhibit in the Visitor Center about the formation of natural bridges at the Monument.